The Exante Diet is a very low calorie diet (VLCD) that offers a simple, straightforward way to consume 100% of the recommended daily amounts of vitamins and nutrients while enabling tangible weight-loss. VLCDs are generally defined as any specially formulated diet that provides complete dietary nutrition with a daily total consumption of 800 calories or less. The Exante Diet Total Solution option provides 600 calories per day. It is a meal replacement plan, which means that instead of measuring, weighing and factoring conventional food to achieve optimal nutritional and weight-loss goals, users simply eat three Exante diet products per day instead. The Exante diet line of products includes soups, food packs, bars and diet shakes. 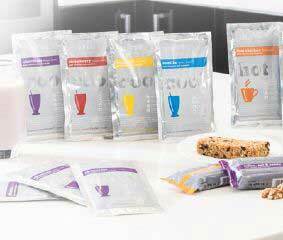 Each product contains approximately 200 calories, so users are free to mix and match whatever three products they desire per day. Additionally, users are encouraged to perform about 20 minutes of light to moderate exercise per day. Former TOWIE star Frankie Essex has recently become the an ambassador for the plan, which she will be following from 12 March through 4 June in a very public attempt to lose 3 stone and fit into a size 8 by the end date. Along the way, she will be documenting her progress online. She has already taken her own “before” photo for a spread in the Mail Online. In addition to the meal replacements, the Exante Diet provides a great deal of flexibility and support. There are 2 VLCD plans, 2 Low Calorie Diet (LCD) plans and even a 5:2 intermittent fasting plan. Eligibility for each plan is determined by a client’s body mass index, in addition to age and any pre-existing medical conditions. There are no required group sessions, and the official website is packed with information, including a very thorough FAQ section. Diet products are available for order and next working day delivery. VLCDs have proven to be very effective with millions of people losing thousands of pounds of weight over the last 50 years in the UK alone. The science behind VLCDs is as follows: The human body stores reserves of energy in two ways. Primarily it is stored as fat (or adipose tissue), with secondary long term energy stores produced and held in the liver and muscles. When the body takes in fewer calories than it needs, it is forced to use these energy stores. As the glycogen in the liver is depleted, the body produces ketones, which is a state known as ketosis. Ketone levels can be easily measured with urine test strips, so users can monitor whether or not they are in a state of ketosis. By following the Exante Diet as directed, users will ensure they maintain a state of ketosis. 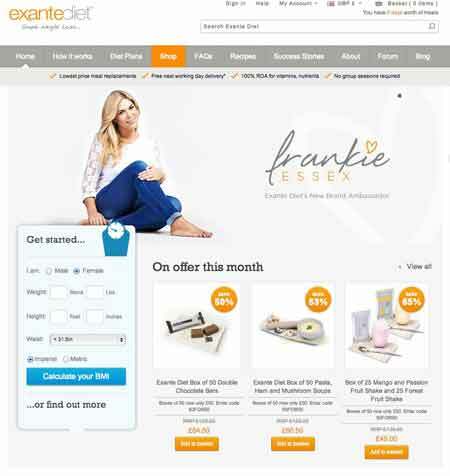 It’s just this kind of ease that Frankie Essex will take advantage of in the bid to regain her confidence. After determining BMI and discussing any medical conditions with a healthcare provider, users simply need to choose the plan that they qualify for. The rest is easy. No matter what plan users follow they will need to consume three Exante diet products per day. For those on the VLCD plans, that’s all there is to it besides water intake and moderate exercise. The two other plans are considered LCDs, and involve a slightly higher daily caloric intake. Users on these plans will have a low calorie, low carbohydrate, high protein meal in addition to the three daily diet products. The website provides several recipes that fit these parameters. VLCD participants can stay on the diet 3 weeks and must have a LCD for 1 week in between. The LCDs also act as stepping stones for VLCD adherents who have reached their goal weight and need to transition back to more regular (non VLCD) diets. 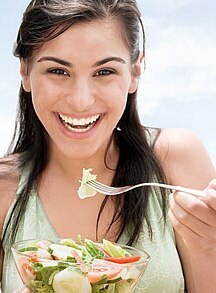 Abruptly returning to previous eating habits after a VLCD will likely result in regaining any lost weight. By following the Exante Diet plans from VLCD to LCD, users can return to conventional food without sabotaging their weight-loss achievements. This is of particular use to yo-yo dieters, which is a term Frankie Essex has used to describe herself in the past. The most commonly encountered side effect of a VLCD, to include the Exante Diet is constipation. This is easily alleviated if adherents drink at least 2 litres of water per day. The Exante Diet recommends drinking between 2-4 litres of water per day. Other liquids can count as water intake, including coffee and tea, and the website further provides a list of other acceptable liquids. What if you could lose weight eating delicious tropical fruit? And not just a little weight—how about ten pounds in only four weeks? Well, according to the Pina Colada Diet Plan, you can do just that. This very new entry into the world of weight loss is making big claims and gaining a lot of attention from people who want to lose weight just in time for swimsuit season. But is eating fruit and drinking healthy shakes the answer to quick and safe weight loss? Let’s find out. 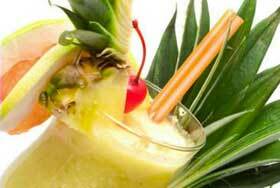 What is the Pina Colada Diet Plan? First off, do not expect alcohol to be on this plan as the name implies. That is not any part of this diet. What it does involve is eating tropical fruits along with a large selection of healthy protein shakes and a healthy variety of foods. It also includes weight loss supplements and advocates regular exercise in order to really see quick weight loss. Here is what you can expect. When you wake up, you will first enjoy some melt water which is regular tap water that was frozen and then melted again. According to the creators of this diet, the freezing and melting processes remove salts and any other harmful material from the water without losing its essential minerals like magnesium, natrium and calcium. After the water, you are then instructed to follow a meal plan with a strong emphasis on vitamin C. A typical breakfast would be boiled eggs with spinach, or yogurt with blueberries. Lunch would either be a specially formulated shake or a regular meal consisting of stir fry or turkey with vegetables. Fish with some butternut squash and zucchini would round out dinner or, in some cases, you might prefer a shake. The Re:Active Skinny meal replacement shake is a two-hundred and thirty-four calorie drink that comes in a pina colada flavour. There is a special powder in it that only requires the addition of some water making it easy to take with you when you are on the go. Another important part of this diet is the inclusion of Re:Active Garcinia Cambogia supplements. 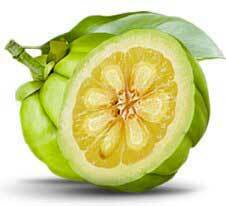 Garcinia cambogia is the extract of an Indonesian fruit that resembles a small pumpkin. It is often used to make chutneys and curries. Garcinia cambogia has hydroxycitric acid (HCA) in it which has been found to be a perfect appetite suppressant. It can also inhibit the production of fat and increase your energy levels. Even more impressive is that it can boost your levels of serotonin which helps to relieve stress and boost your mood. The cost of a four-week plan is $66.50 or £39.99. This includes a diet and exercise plan, the shakes and the garcinia cambogia supplements. To pay so little for a four-week plan that includes a diet and exercise plan plus the required supplements is a rarity. Most diet plans nickel and dime each part of their plan whereas this one is a complete package. And the fact that the diet’s creators advocate healthy eating and regular exercise is a testament to their knowledge on what constitutes the right way to lose weight—by creating healthy habits that will become a regular part of your life long after you hit your goal weight. The shakes are easy to make and even easier to take with you. Garcinia cambogia is a common ingredient in many of today’s most popular weight loss supplements. And with all the research and science behind it, you would be hard pressed to deny its ability to help you lose weight. Some may argue that the calorie intake on this plan is too low. For some, it may be on the low side. If you require additional calories for medical reasons, then you definitely need to go over that with your doctor. If you do not have a medical condition, then you can always try eating more food and less shakes if you prefer that as some people do not like to necessarily “drink” their meals. There is nothing harmful with this diet. It encourages eating healthy and regular exercise which are paramount to successful weight loss. The shakes and supplements are safe to use and do not appear to have any adverse side effects. With that being said, you need to realize that you must follow this plan as it is intended. Wavering from the food and exercise plan is going to hinder any progress in your weight loss efforts making the whole thing ineffective. Bottom line—you will lose weight with this plan as long as you follow it to the “T”. It could be argued that you will be served by just using Garcinia Cambogia. Did you ever think a diet that mimics the way your caveman ancestors ate would become one of the fastest growing diet and weight loss plans? Well, that is exactly what has happened with the Paleo diet. With the increasingly high rates of obesity, disease and overall bad health, researchers began to wonder if this was due to all of the overly processed foods that many people eat on a regular basis. They thought that perhaps our bodies are not processing these foods well because they were never designed to eat them in the first place. Think about it—there were no pizzas, frozen dinners, chicken nuggets or spaghetti during the Paleolithic period. There was also very little, if any, incidences of cardio vascular disease, cancer, chronic inflammation or all the other illnesses found in today’s Western cultures. After conducting all of this research on how our ancestors ate, the Paleo diet was born. The list of foods and drinks that you can eat on the Paleo diet is somewhat limited and comes as a bit of a shock when people first see it. The only allowable foods are meat (preferably grass-fed), seafood/fish, fruits, vegetables, eggs, healthy oils (like coconut and avocado), nuts and seeds—basically all the foods that Paleolithic men ate. 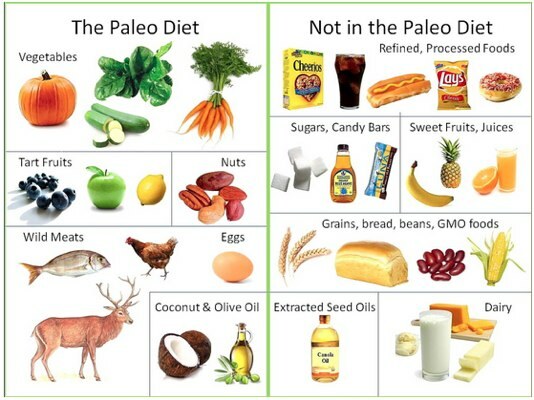 The foods that are not allowed on a Paleo diet include anything processed, sugar, caffeine, alcohol, potatoes, grains, legumes (yes, peanuts too), salt, refined vegetable oils and dairy. At first glance, you may wonder why anyone would limit themselves to such a small sampling of food for the rest of their lives. But die-hard Paleo followers will tell you that they have never felt or looked better since adapting this way of eating. While the food options are somewhat limited, the diet does eliminate many of the foods that are the cause of many health problems like processed foods and sugar. As a result of not eating these foods, your body starts to function the way it was intended without the sick, tired and not-so-good feeling people often experience. Those who follow a strict Paleo diet claim that they have lost weight, they sleep better, their moods are much improved as is their mental function, and they have more energy. Some experts state that you can also lower your blood pressure and bad cholesterol levels, and reverse specific autoimmune diseases. One of the reasons for the diet’s effectiveness in improving health is because it is low in sugar so insulin stays ate normal levels and your body does not go through the ups and downs (better known as spikes and drops) that can do harm to your body’s functioning systems and cause a myriad of health problems. Eating a Paleo diet has some definite advantages including those mentioned like losing weight, increasing your energy level and feeling better. The focus on natural, whole foods is also a great way to eat a healthy diet while eliminating foods that do more harm than good. On the flip side, it can be difficult to give up foods that you have lived on most of your life like dairy, grains, peanut butter—even caffeine. The diet may be too limiting and too much of a drastic change for you to maintain for the long-term. And the Paleo diet is not a plan with a beginning and an end like other diet plans. It is a way of life for most of its followers who usually never go back to their former way of eating. Why would anyone not want to try a diet that has so many health benefits and relies on food in its natural state rather than being processed and stripped away of its vital nutrients? But if you do set out to eat a Paleo diet, start slow. Rather than give up every food on the “don’t” list at once, try giving up one each week or every few days to give yourself time to adapt to the change. If you attempt to do it all at once, you may get frustrated and give up on it. Also beware that the diet includes a lot of fat, albeit healthy fat. If you are trying to lose weight, be mindful of how much fat you are eating so you do not overdo it. What the Paleo diet will not, and should not do, is leave you feeling deprived or starving. The allowable foods are loaded with protein and healthy fat which should get you through each day with a lot of energy and little chance of feeling hungry. There are many books, magazines and websites that focus on the Paleo lifestyle. They offer excellent recipes and tips for making the diet interesting so you do not get bored with eating the same foods. In the end, do what feels right for you. You can eat a Paleo diet every day of the week or a few days a week. It is all about finding the right balance in terms of your goals and your lifestyle. 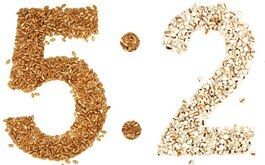 The 5:2 Diet – this is fast the fasting or intermittent fasting principle. This has been in the media lately due to Michael Mosley’s branded version – The Fast Diet. It is well worth a look and can be used in conjunction with the 5:2 Fast Formula, an appetite suppressant that can help you through the hunger pangs and replace lost minerals. Fitium – an online diet program, that has been created with the help of a doctor, nutritionist and personal trainer, putting years of experience into an easy to follow system, you can access online 24/7 from the comfort of your home. The cost is just a few £/$ a week – the price of a Starbucks coffee as they put it. It does require you do something but your chances of success are high. It depends if you actually want to lose weight or are just happy with idea of losing weight.